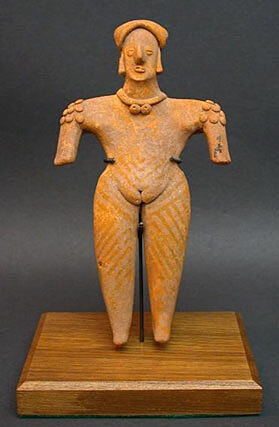 This beautifully sculpted ancient figure of a "Pretty Lady" has the head covering overlaid by the headband, adorned with long ear ornaments, appliquéd necklace with two medallions, multiple appliquéd shoulder pellets, a long tress hanging down her backside, and decorated with strong remains of unique painted design details on her frontside mid-section and legs. This lady is a solid 'flat figure' from the Tuxcacuesco-Ortices tradition of Colima/Jalisco in West Mexico, Late Preclassic Period. She is delicately mounted on a custom teak stand. The intricate design pigmentation is of a yellow ochre color, and is extremely rare, as nearly all figures of this type and age have long since lost or faded the details of their painted work. Provenance: From a Los Angeles area collection formed over 40 years ago. Condition: Aside from two tiny perforations, one on the right leg, and one on the lower back, this 'flat figure' is in excellent condition.